Download a binary rom image that you can play with a 2600 emulator. Download Z26, it's a great 2600 emulator available for DOS or Windows. The link takes you to the Z26 homepage. 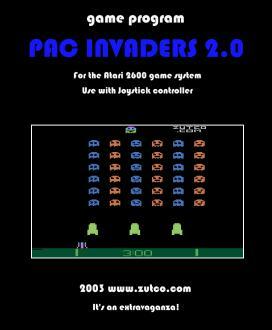 Click here for Pac-Invaders cartridge availability info. We're just videogame fans, like you. ZUT Games, ZUTCO and the humanized eyeball device are our trademarks.